Generally faculty have created three types of class blogs: course information site (no student blogging), class blog (all students added as Authors to the course site), course site with student blogs (students each have their own blog and their posts are fed into the course site). Let’s walk through how to create each type of site and best practices for archiving them. Use your College username and password (your Voices password will change when your College Office 365/Outlook email password changes). Create a separate Voices account so that your username and password are not connected to your College credentials (and your password doesn’t change). Click the “Register” link in the upper left corner on the toolbar. Username: This will be your username for the voices.wooster.edu blogging site. It does not need to be the same as your Wooster username. Password: This will be your password for the voices.wooster.edu blogging site. It will not sync with your Wooster password and will not change when you change your Wooster password. Yes I’d like to create a new blog: Select this button if you would like a blog. Site Domain: The text you type in this box will be the* *Blog URL followed by “.voices.wooster.edu” to act as the web address for your blog. For example, if “mycourse” were typed into this box, the address for your blog would be http://mycourse.voices.wooster.edu. Site Title: This is the name of your blog and will be displayed at the top of your blog pages. It can be changed later along with a tagline. Privacy: I would like my site to appear in search engines, and in public listings around this site: It’s a good idea to have search engines index your blog. This helps protect you by archiving your work in case of a severe issue with your blog occurs. If privacy is a must, then check “No”. Select a template: If you are creating a course site, consider selecting a Course template. Otherwise, choose either the Blog or Website template. 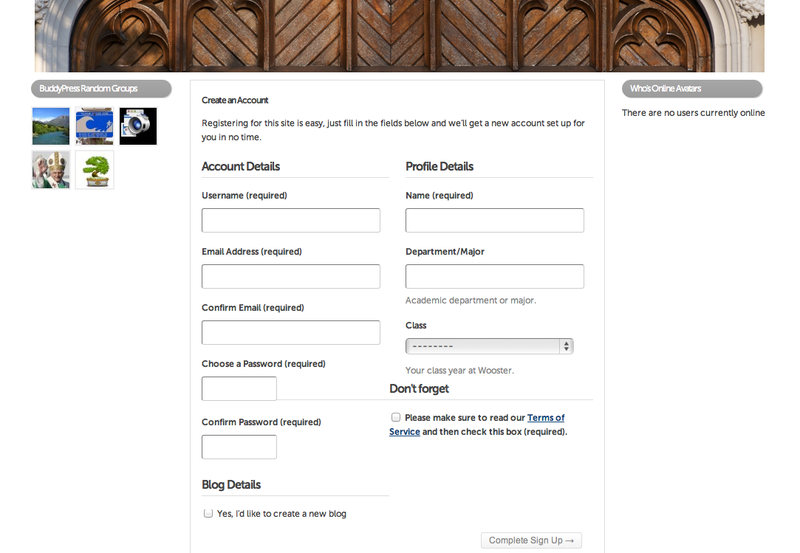 An email will be sent to your Wooster email account with a link to activate your Voices account. Follow the link and then click log in from the navigation bar at the top of the screen (see below) or use the login widget in the right sidebar. Click the “Log in” link in the upper left corner on the toolbar. Login with your College username and password. Your Voices account is synced with your Wooster credentials and your password will change when your Wooster Office 365/Outlook password changes. To create a class blog a faculty member would complete the steps above for creating a course site/blog. Once this is done the faculty member would activate the Add Existing Users plugin on the Plugins page (already activated if using one of the course site templates). 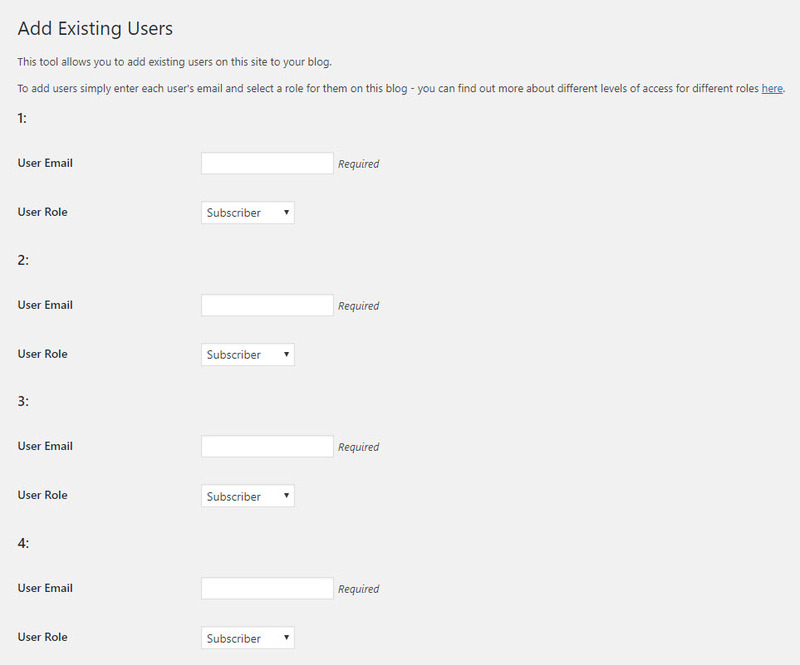 Now, click on the Users panel and click on Add Existing Users. You can enter up to 15 student emails in the available fields and select the role of each student (Author should be what is selected for most students). At this point all of your students will be able to write posts on the class blog. The faculty member needs to complete the steps for Creating a course site and Creating a class blog. 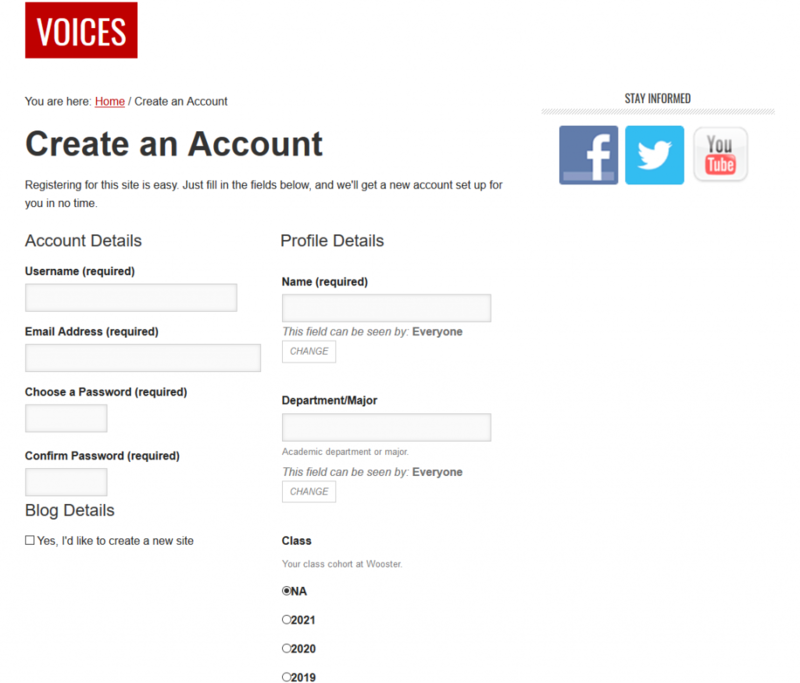 In addition, each student will need to complete the steps for Creating a Voices account and a blog. The faculty member will need to enable the FeedWordPress plugin. The faculty member will then need to add the URLs for each of the student blogs into the FeedWordPress plugin’s settings. The FeedWordPress plugin will pull the posts from each student blog and post them on the class blog. Until a screencast of enabling and configuring these two plugins is completed, faculty should feel free to contact the Educational Technology for help.